NERTEC 2013 pictures added in links. Thanks to my wife, I was able to get away from my display and hear a few concerts. Everything I heard was top notch. It was a special treat to hear Don Harry's and Scott Mendoker's recitals. Both performed on the J-445. These are guys that make anything they play sound great. I am honored they chose my tubas. Both were extremely musical and sensitive performances, Don's on Friday and Scott's on Sunday. Carol Janstch's performance (not on a BMB) was very impressive never mind she did it standing up and in high heels. 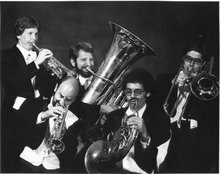 I was gratified and encouraged by the comments I got about the Big Mouth Brass tubas. I thought some were pulling my leg about how good the BAT is but I was able to muster up enough chops to play a few notes on the notable competition to understand the sincerity. I had a good chat with Scott about sound, pitch, and the Arnold Jacobs approach. I think we had similar experiences in our studies with Mr. Jacobs, albeit his were a decade later. 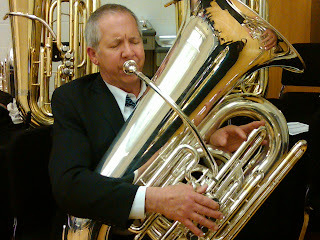 He confirms that I am making a complete line of tubas for the tradition in which we were schooled. I'll post some thoughts soon. Pictures are in the links. Thanks to everyone who came by to try tubas.